Early in 1959, a drunk and incoherent Billie Holiday performed a handful of songs to an audience of seven patrons in a shabby Philadelphia bar, slugging booze from a 'water' glass throughout her set, before staggering off into the night. Four months later she was dead, destroyed by hard living, drink and drug abuse. She was 44 years old. Laine Robertson's smash-hit Broadway show Lady Day at the Emerson Bar and Grill makes this shambolic gig the hook for exploring one of the truly great jazz tragedies. Rather than presenting a linear A-Z biography, his script meanders through Holiday's addled mind, each number she sings triggering a particular memory, gag or grievance. The result is a stark portrait of a disintegrating life. 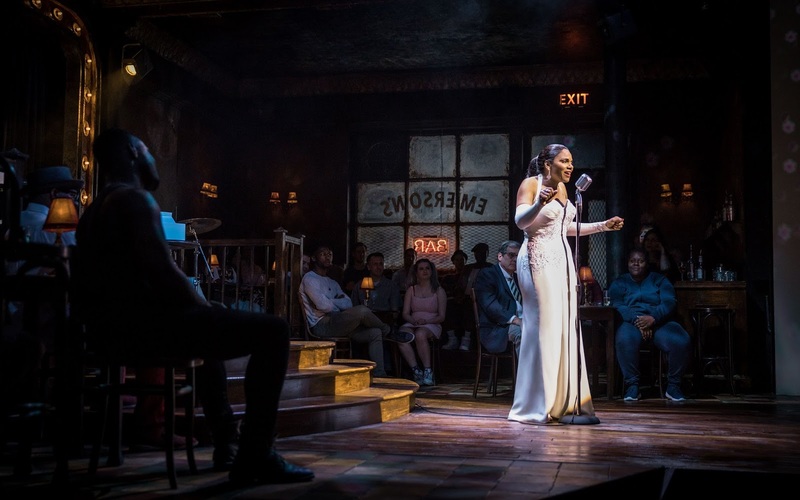 Audra McDonald's tour de force Broadway performance won her a record-breaking 6th Tony Award and she absolutely deserves every plaudit going for so completely inhabiting this legendary character. From the moment she opens her mouth and that unmistakable voice winds out, Lady Day is in the house. McDonald’s mercurial Holiday – by turns engaging, sassy, angry, witty, vicious and terrifying - becomes increasingly incapable as the evening wears on and the 'water' glass empties repeatedly. The decline is unbearable to watch, but impossible to look away from. McDonald is supported by a cracking band - Sheldon Becton (MD/piano), Frankie Tontoh (drums) and Neville Malcolm (bass). Not only do they play up a storm, but they also convey the fear and embarrassment of being trapped onstage with an imploding star. Becton, in particular, plays Holiday’s accompanist Jimmy with a painful combination of respect, concern and increasing panic. The costume, hair and makeup designers place Lady Day before our eyes – white gardenias and all – while Christopher Oram’s set cleverly transforms a plush West End auditorium into a dilapidated jazz club, creating the atmosphere of small-time failure there must have been at that original car-crash of a gig. And then there is the music. Not only do McDonald and the band perform Holiday’s material brilliantly, but the songs are so cleverly worked into the script that many carry resonances beyond their surface meanings. (Crazy He Calls Me, God Bless the Child, Don’t Explain etc). By the time her devastating signature number Strange Fruit stops the show, the audience is applauding McDonald, Holiday and Abel Meerpol’s brutal lyric in equal measure.